We’ve talked about October being Fair Trade month before, and this year we’ve unearthed a clever new way to integrate that into your Halloween celebrations: Reverse Trick-or-Treating! Showing that kids are capable of making immense change in our world, they will be handing adults a sample of Fair Trade chocolate. The tasty treats will be accompanied by a card that talks a bit about the child labor and poverty problems in the cocoa industry. The solution is deliciously simple: don’t cut cocoa out of your life, just swap the commercial stuff for Fair Trade chocolate. Thanks to some awesome Fair Trade companies, the chocolate and cards are FREE (you just pay for shipping). If you want to participate, just register by October 13, 2008. If your wee monsters will be out candy collecting anyway, why not add Reverse Trick or Treating to the night and create a wonderful new family tradition? Want more Fair Trade chocolate options? Check out the extensive lists of manufacturers at Trans Fair USA, and New American Dream. As featured above, there are Fair Trade Halloween kits that make treat-giving on The Big Night super easy. 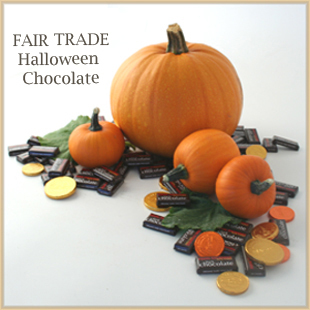 In addition to the 42 delicious chocolates, you get 42 Halloween postcards to hand out that explain how cool and easy Fair Trade is.